How would APi Communications define Audio Visual (AV) interpretation in museums and what does it involve? ​Audio visual interpretation should be just that, something that enhances the understanding of the objects and space creating more interest and bringing them to life without being so dominant as to ​overshadow and become more like a theme park. Why is AV important to museums and cultural organisations when it comes to planning exhibitions and content for the venue (and possibly off-site events)? What expertise does APi Communications offer cultural organisations? ​APi could be described as a bunch of problem solvers, but all with creativity within. We are particularly adept at working in historic spaces and overcoming restrictions on particularly cabling, being adept at camouflage and​ using technological solutions to ​enable communication. Our creative side often comes out in assisting our design and production partners to produce content in a way that best utilises the hardware capabilities of our systems. Can you briefly describe the technology you use on your projects and explain some of the latest developments in AV? What are the challenges APi Communications faces while managing an AV project for museums, galleries and heritage attractions? ​The greatest challenge with AV apart from how to deliver what is required within the aesthetic of the space is always that the hardware being sensitive stuff should not be installed until the space is clean. This means we are always starting when everyone else is practically finished and ​usually running over time. This puts a lot of pressure on the time we have available, so remaining calm and polite and taking enough time to do a good job can be difficult. What are the best practices in AV? ​In the same vein we like to leave some spare channels/inputs available ​within a system as it is surprising how often we get asked ‘can we add this’ at the last minute. I would also encourage design teams to consider the practicality of the proposed content in the context of the space. Low contrast images in a brightly lit area for example, or atmospheric sounds that actually mask the intelligibility of the main speech information. Both may look good in the studio but work less well in the actual environment. What are some of the main points museum professionals should consider when thinking about including AV for their interpretation? ​Reliability is always number one for us, good for us and good for the customer. Realistic time tables and a good project manager are always welcome. Recently we have been working in ​St Mawes and Pendennis castles interestingly putting in interpretation for both Napoleonic and WW2 eras at the same time – very different content. A team of Tudor gunners can be seen in action with the new immersive installation and in the 2nd World War Battery Observation Post, visitors can listen in to conversations between the commander and his gun crews. APi used ​laser front and rear projection for low maintenance, life sized images and digital signal processors ​with multiple audio channels to create immersive sound ​scapes. What are some of the latest AV projects that APi Communications has been working on and how have these improved the interpretation in these cultural establishments? ​Recently we have been working in castles and interestingly putting in interpretation for both Napoleonic and WW2 eras at the same time. This has been great fun using some clever digital signal processors and multiple audio channels to create immersive sound plus life size projection. Enrolment Area – Here a sergeant interviews a volunteer, the sound is produced by out of sight pendant speakers, triggered by a sensor as the visitors enter. Train Carriage – The Train Carriage has two silhouettes sitting in an imaginary train carriage. Two loudspeakers, one above each of the silhouettes give the impression of them in conversation. The train window is replaced by a 32” NEC Screen showing images and the dialogue. Advance! The Advance trench simulation area has six flown speakers located above the trenches, and two hidden 15” active subwoofers located behind. 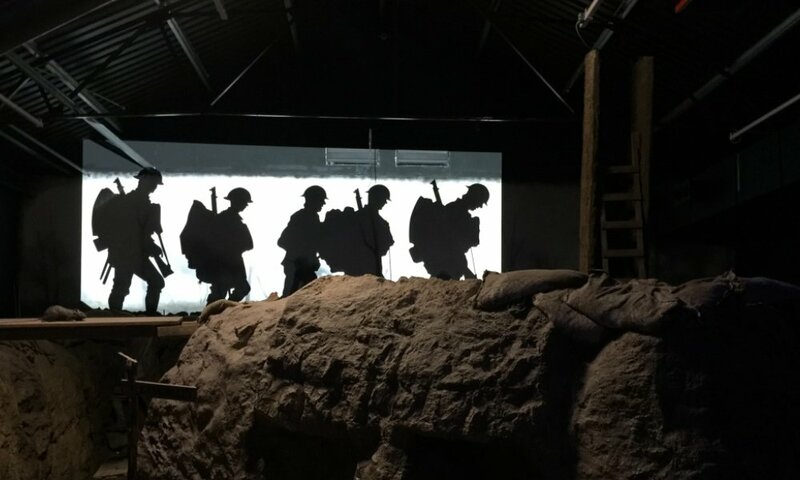 A Panasonic projector displays silhouetted scenes of troops going over the top projected large onto the rear wall. German Machine Gun audio and light effect. As a corner is turned you are confronted by a German machine gun nest and lights are triggered from the sound to give the effect of being under fire, providing an immersive visitor experience. 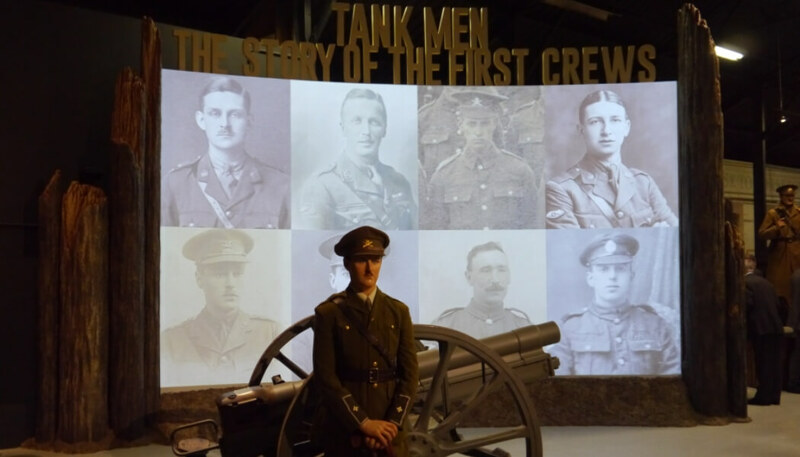 The World War I Credits area has a large 4m projection screen carrying information about the first crews with sound from directional column speakers. All the areas are controlled by one on/off switch, to ensure ease of use by the museum staff. Some of the areas are controlled by motion sensor and all areas with audio have an induction loop hearing system. There is also an audio mute switch in each area, enabling museum staff to switch the sound off selectively during tours.